The Leslie and Susan Gonda Building, designed by Ellerbe Becket and Cesar Pelli & Associates and constructed in 2000 and 2001, is situated at the center of the Mayo Clinic campus in downtown Rochester. Viewed from the exterior, the building consists of two distinct sections, each 21 stories tall. The northern section has a curtain wall system with granite spandrel and column panels. 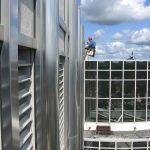 Stainless steel covers with round and square profiles are used to cover the joints between panels and at the window surrounds. A stone-clad elevator bank rises to 22 stories on the north side of the building. 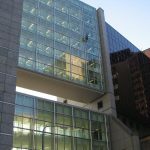 There is also a seven-story skyway that connects the north side of the building to another Mayo Clinic building across the street. The southern portion of the building, which has only east and west façades, has an undulating curtain wall system consisting entirely of glass panels. 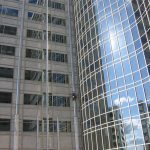 Painted aluminum covers with a round profile are used at the vertical joints of the glass curtain wall and painted aluminum covers with a square profile are used at the horizontal joints. Close visual examination of representative areas of the curtain wall façades with minimal impact on building occupants and public.